As you may know, here in the US the Social Security Administration tallies up the names of all the babies born within a year and reveals which names were most popular. While there are clearly thousands of parents who are happy using popular names, there are also parents who would rather avoid them. For those parents who may secretly like the sound of the top names but hate their popularity, I've created a list of alternative options to the Top 10 names for girls. The names may be similar in sound, syllables, initial letter, meaning, origin or a combination of those. None of the alternate names below rank on the SSA's Top 1000 most popular names chart in 2014. 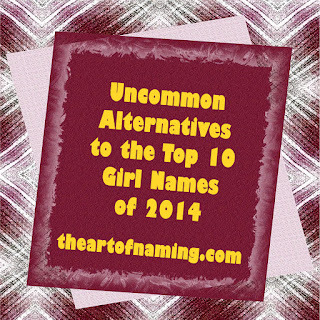 What do you think of my uncommon alternatives to these popular girl names? Don't forget to check out the alternate names I chose for boys too!